Our seventh official meeting was strikingly different from those that have come before. We met at the J again, but this time it was a Thursday evening, instead of a Sunday afternoon. I should have polled folks, to see whether that was a good time for everybody, because apparently it wasn't! The only members who made it were Tim Rocks, Ed Abernathy, and me, Chris Garrison. However, the low turnout resulted in deeper conversations, leading to a few revelations. We discussed deadbeat clients, clients who ask for endless revisions, ink cartridge hassles, systematic societal problems, etc. And it came out that Ed is a former prop comic! He traveled the circuit for years, back in the day, sharing the stage with comedians you've heard of. And he even opened for Carrot Top! Crazy. Ed said that maybe he could get some of his contraptions working and bring them to a future slam, so that's one more reason you should attend. With two seasoned caricaturists present, we should have spent time drawing each other. I could've honed my skills (or lack thereof) at caricature. But it didn't occur to me to organize that, because I wanted to try out a new feature of the Salty 'Ham Slam: The Gauntlet. Nobody brought anything to run through the Gauntlet, but I was ready for that. 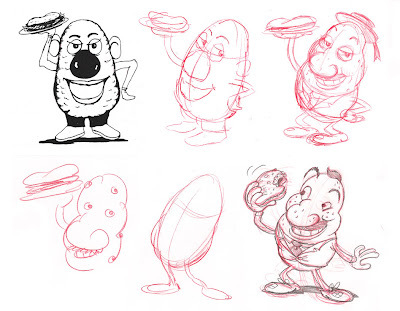 I suggested we critique the baked potato mascot from Al's Deli & Grill. I love Al's, but I don't love their mascot. He's way too similar to Mr. Potato Head. And since he's seen every day, by so many people on Birmingham's Southside, he sort of represents our cartoonists' community . . . poorly. So we put him on the chopping block. We dissected him and put him back together. 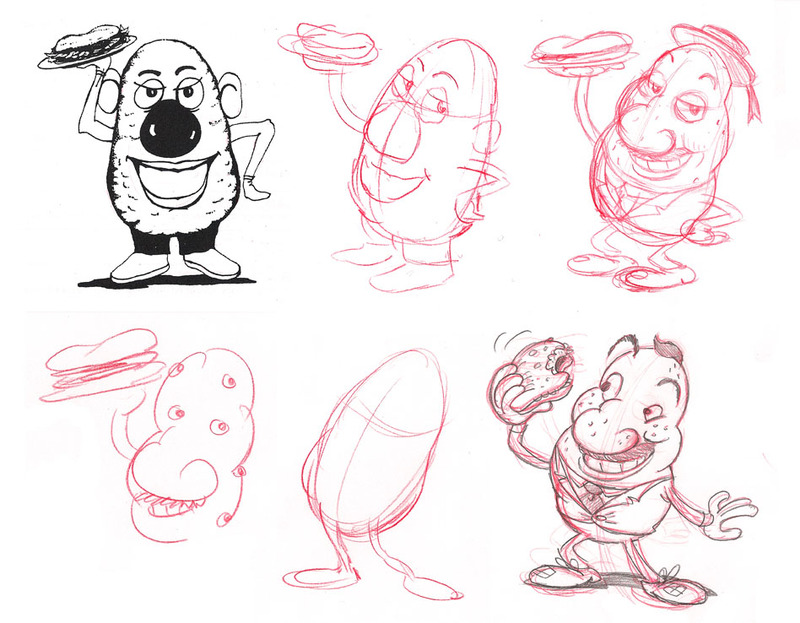 Click this image to see the original mascot, the sketches I made as we explored the potato's issues, and the final outcome. I wouldn't present this to Al's; they're probably married to their current potato. But I think we all learned a thing or two, through this little exercise, so . . . You REALLY should have been there! OMG! i wish i was there. I was at Al's last night and I've always thought that character looked kind of like it was in drag, the potato dimple arrangement resembling a five o'clock shadow. It seemed an unsavory and troublesome creature and i wouldn't want it handling my food. In my final version there, I've got him in a suit, because I was picturing him as a restaurant owner. But it just occurred to me that he might have looked better in a T-shirt and apron. yeah in the suit he looks like a silent movie villain. The Hamburglarist. Cartoon by: Rosko - defunct?